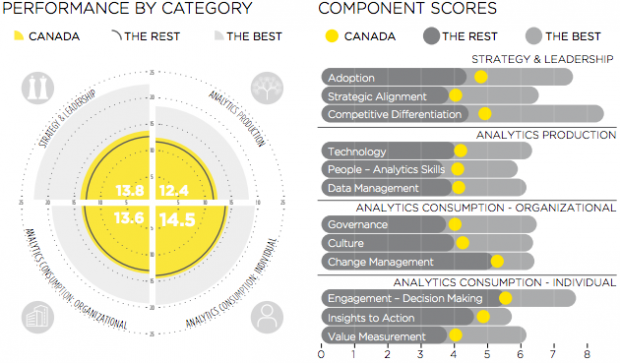 Canada is pulling ahead in the race for better analytics, according to a report released this week by EY. The document, Analytics: Don’t Forget the Human Element, highlighted Canada as a leading light in both the adoption and consumption of analytics data. The company’s Canadian branch surveyed 564 executives, globally, 10 per cent of which were in Canada. Nearly six in every 10 Canadian companies said that analytics are a strategic priority at the executive level. In the ’90s, computer systems that crunched numbers to provide executive insights were known as business intelligence systems. Analytics today is a different animal, argued Steven Maynard, partner and national analytics practice leader at EY. Thirty-one per cent of Canadian executives felt that analytics has better prepared their organizations to meet today’s challenges, compared to just one in five U.S. respondents. Figures that show Canada leading the U.S. in adoption of a new technology contrast with traditional perceptions of Canada as a technologically conservative economy, with a lower level of investment and a more risk-averse customer base. Maynard suggested that the pressure of a competitive market is fuelling Canada’s trailblazing approach as companies look to data for a competitive edge. 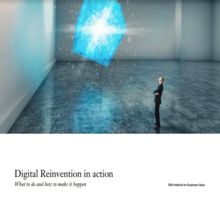 One significant statistic in the report revolved around the consumption of analytics. The danger of a sophisticated analytics tool is that it may produce mounds of data that nobody uses. Canadian organizations were particularly good at encouraging the consumption of analytics data, with one in four companies offering bonuses or rewards for new initiatives derived from analytics-driven insights. This compared to 27 per cent in the US. According to the report, Canada outperformed the global respondent base particularly in the areas of adoption, competitive differentiation, and people-analytics skills. An effective analytics program can often take considerable computing resources. Small and medium-sized businesses – of which Canada has a large proportion – might find it harder to acquire and configure those resources in-house. Is that a problem for Canadian adoption?